camera equipment getting a little crammed. In a tropical climate like here in on our little island of Okinawa its very important to keep your camera bodies and lenses stored in a dehumidified environment when not being used as the humidity can quickly do some nasty stuff to your expensive investments. 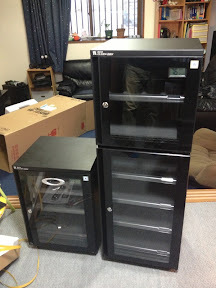 Just ordered in a new much bigger one here at the fotoShisa head quarters to make room for some new gear. 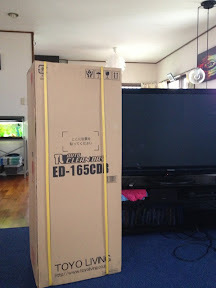 This is the Toyo Living Auto Clean Dry ED 165CDB dehumidifying cabinet or in Japanese (whoa what a mouth full) ordered from Amazon Japan. I checked at Kitamura Camera but it was much more expensive there. Even from Amazon you wont see much change back from 50,000yen or $500 but worth every penny I think. 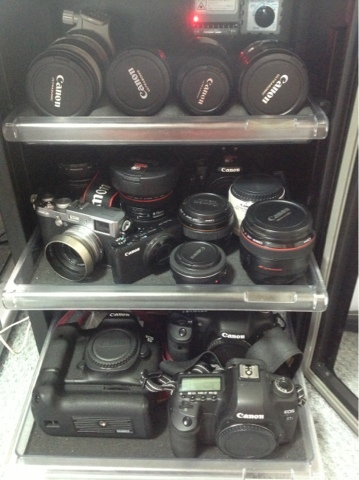 The new lens cabinet next to my old smaller one. Plenty more gear real estate now. And finally in the office with gear loaded up being dehumidified. If all goes well I will shortly have the Canon 300 f2.8L. Once that arrives its going to be taking up a fair chunk of the dry cabinet. Even if your not living in a high humidity area I would still highly recommend getting one of these to keep your precious gear stored safe and clean. They also can be locked for security which is a nice bonus especially when you have little kids around the house always trying to get into things. 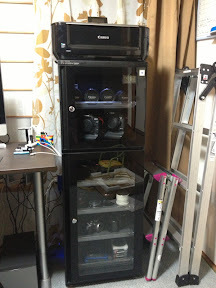 If you would like to search for this cabinet in Japan copy and paste the Japanese name below. You have pro bodies and pro lenses right? They're all weatherproof ja nai? Yes I do. Nah they are not all weatherproof. And even the ones that are weatherproof can still fall victim to nasty mould and dust getting inside them especially down here in Okinawa. Always best to keep gear in a dry cabinate.